The PAW Patrol are back on DVD in PAW Patrol: Ultimate Rescue. Fans of these furry rescuers won't want to miss a moment of these wildly brave missions as Chase, Marshall, Rocky and the rest of the pups save the Royal Kitties, stop a mechanical monster, rescue a swamp creature and more. 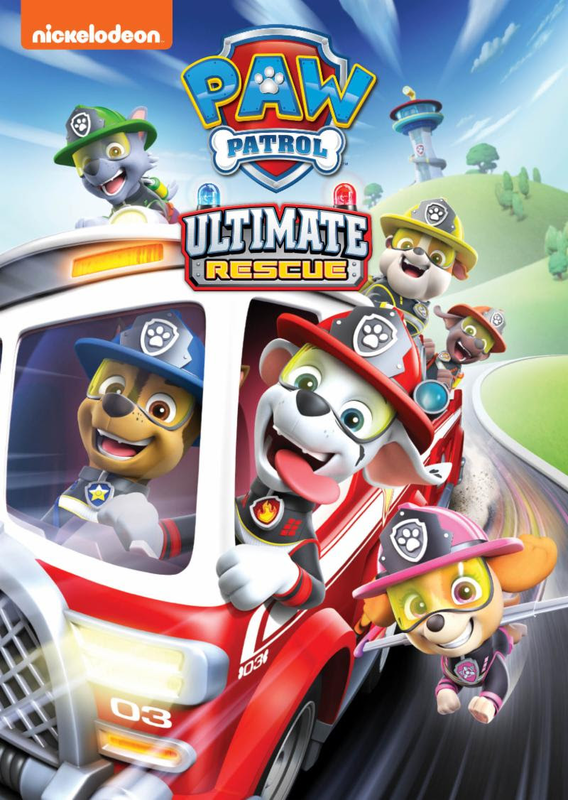 Produced by Nickelodeon Home Entertainment and distributed by Paramount Home Media Distribution, PAW Patrol: Ultimate Rescue will be available on DVD April 9, 2019 for the suggested retail price of $10.99. Pups Save the Royal Kitties - After the Royal Kitties are kidnapped on their way to Adventure Bay, Ryder needs all the pups to help Chase investigate this case in an Ultimate Police Rescue. Pups Save the Tigers - When searching for the elusive rumble top tigers, the Turbots fall into a cave deep inside a volcano. The PAW Patrol complete a paratrooper style rescue from Skye's Ultimate copter in this Ultimate Aviator Rescue. Pups Save the Movie Monster! - After the envious Mayor Humdinger tries to commandeer Adventure Bay's mechanical movie monster, the pups must join Marshall for an Ultimate Fire Rescue to stop the fireball breathing robot. Pups Save a Swamp Creature - When something goes wrong on the swamp tour, it's Zuma and his Ultimate Swamp Vehicle to the rescue! Pups and the Hidden Golden Bones - Everything is shaking and breaking beneath Adventure Bay, so Ryder needs Rocky to lead the pups on an Ultimate Fix-it Rescue. Win: One lucky winner will receive a copy of PAW Patrol: Ultimate Rescue on DVD! The deadline for entries is April 2, 2019 11:59pm HST. If you submitted an eligible entry and it is chosen by random.org as the winner, you will be notified via email on or about April 3, 2019 (make sure your email address is in your profile or comment and be sure to check your junk/spam, etc. folders) and will have 3 days to respond. I'd love to win this for my nephew for his birthday. He loves paw patrol. I love these little pups and their adventures - so does my son! I'd love to win this DVD for my grandsons because this is one of their favorite shows to watch! My nephew woudl like it. I liked FB page as Abigail Gibson. My son likes Paw Patrol. I would love to winthis disk for him. My nephew is all about Paw Patrol. I would love to win this for him--he is the youngest of five and doesn't get a lot of things that were his originally. I would like to win this for my son. He likes Paw Patrol. Would love to win this cute dvd for my great-grand-daughters; aged 4 and 7. I would like to win this for my granddaughter. She's a huge Paw Patrol fan and can name all of the characters. I'd like to win for my friend's kids. I would like to win this for my niece. She would enjoy watching! My 3-yr-old son is a huge Paw Patrol lover, and this would be perfect! Looks like a cute movie. I know my grandchildren would love watching it. Thanks! I would love to win because this is my granddaughters favorite show! I would love to win this for my littles as they are huge Paw Patrol fans!